This dress is in very good condition. The dress is a satin type material making it very cool and lightweight to dance in. The sleeves and skirt are soft pleated. 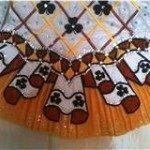 The cape is shamrock and has been decorated in diamantes. 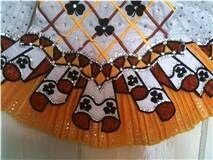 There are some tan marks on the underneath the skirt however this doesn’t show on stage. There are no diamantes missing on the dress. there is no room to let out and down as the dress has been altered. Sale is final. Asking Price: £450 or best offer. Shipping costs are not included in the asking price.